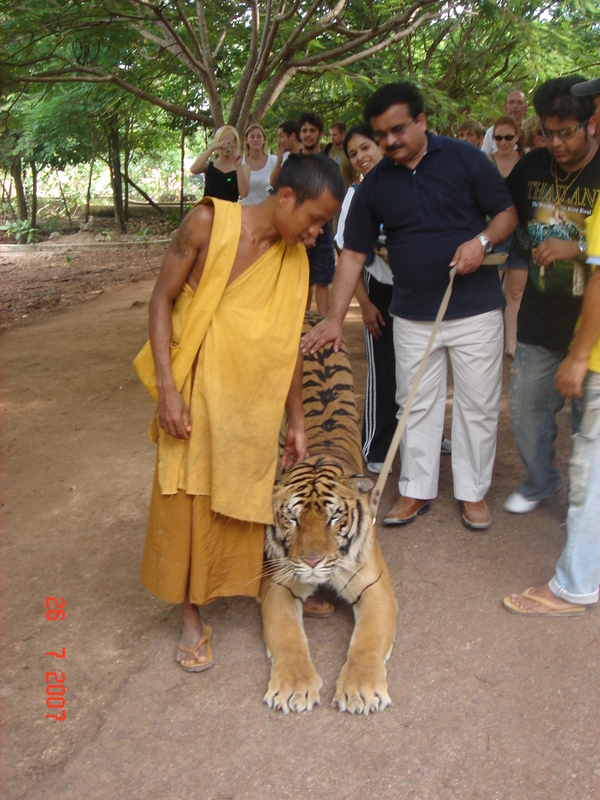 There is I think just one place in the world where you can take a Tiger for a walk instead of the other way round. 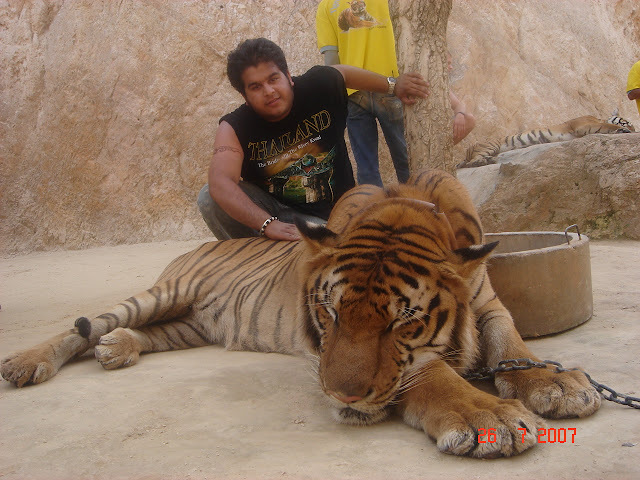 It is the Tiger Temple located 2.5 hours away,North from Bangkok in the forests near the Myanmar border. 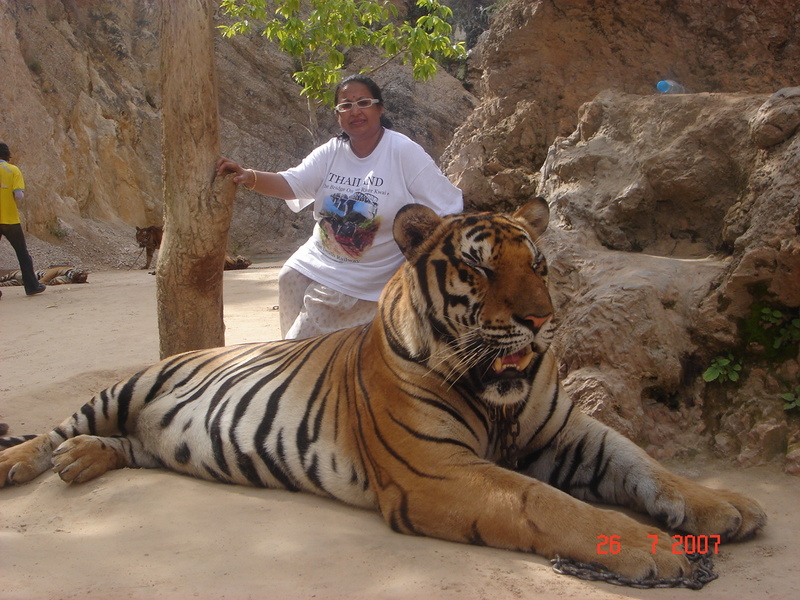 Thailand is a top destination for travellers and The Tiger Temple is one of the most popular tourist place in thailand.Just outside there is a shop which sells T shirts and trousers. Visitors to the temple are forbidden to wear red colored clothes and also clothes which show a lot of skin. probably the tigers are attracted to both. So we had purchased black T shirts from there before we were allowed to enter. The entry fees is about 600 Baht but you have to sign a form in which you fill your details and also sign it after reading something like "I am entering an area which has dangerous wild animals and I am fully responsible for any untoward or unfortunate incident which might take place". I think anybody who reads that has second thoughts about going in ,at least for a second or two. Once inside after a short walk we came to a quarry kind of place where there were about 8 tigers lolling around as if they were enjoying the afternoon siesta. One of the tigers appeared to be less dangerous because visitors were getting photographed with Tiger's head in their lap.In one case the tiger started showing more interest in the person who was getting photographed after which the Head in the Lap photographs were suspended for the day. 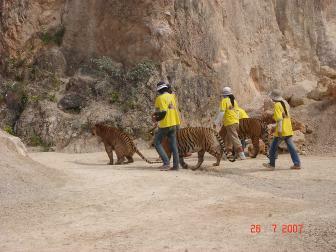 After this we took our turns getting photographed with the tigers of our choice. It was getting cooler and also the siesta time was getting over and one of the tigers suddenly sat up and let out a growl. We had been warned not to make any sudden move if the tiger reacted to the touch. 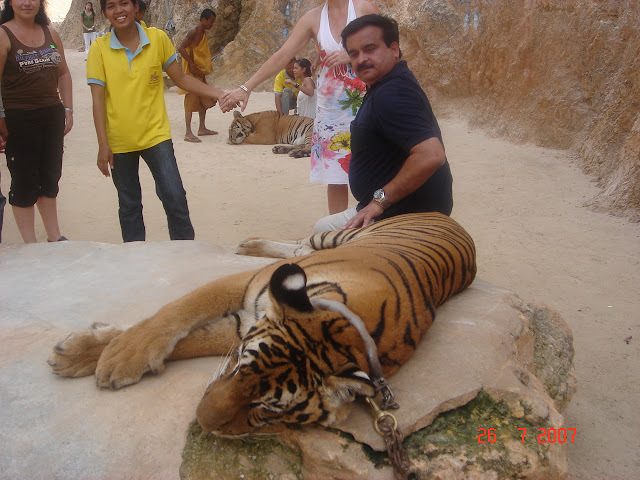 The tigers were peacefully posing for the photographs along with the visitors who were not really aware of what all a tiger can really be up to. Please see the most viewed video on You tube just to have an idea what turn events could take. 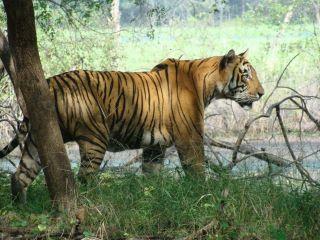 It is called Tiger attack video and is set in Kaziranga, East India. The Tiger Temple was initially a Buddhist Monastery and the tigers were the surviving cubs of tigresses who had been poached.The poachers reportedly used to stab the cubs and take away the dead parents for whatever. The Monks used to nurse the cubs and wanted to release them in the wild but that never happens.In fact it cannot. This is an excellent photograph posted on facebook by Rajeev Tyagi who was studying in college with me and is currently a Conservator of Forests in Rajasthan. 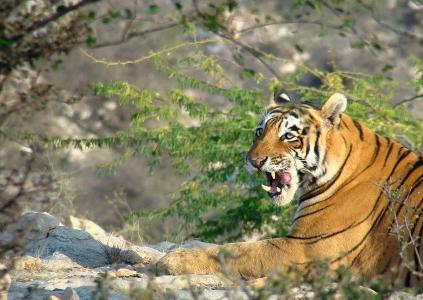 This is a tiger from Ranthanbore. The tigers in Tiger Temple are breeding also and there were a couple of cubs who were quite playful and were climbing all over the Monk who was handling them. A tiger cub can easily jump 20 feet and they were jumping on the visitors also occasionally much to the amusement of the onlookers. 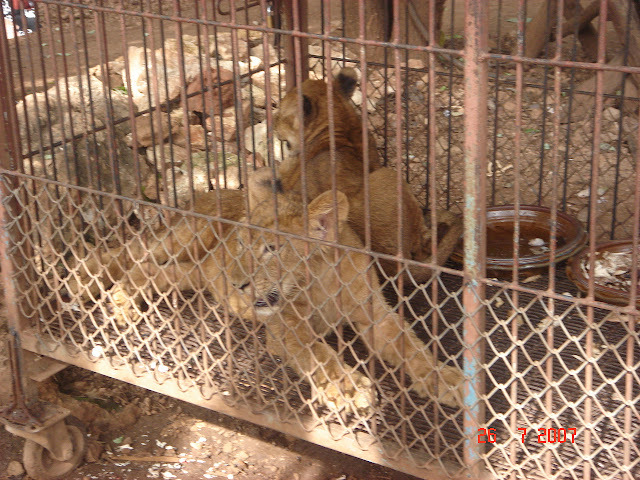 As the evening progressed the tigers started getting up and were soon led away to their cages. It was at this time visitors took turns to hold the leash of the tigers. As soon as the tigers were secured in their cages a tractor trolley went around the whole area throwing various kinds of vegetables like turnips,cabbage,cauliflower along its path at the same time emitting a loud whistling sound. A real stampede occurred and hundreds of pigs, deer, horses came running to eat up the vegetables. The onlookers scampered out of the way and total confusion reigned for half and hour. Our visit to Tiger Temple came to an end and here is another photograph posted on FB by Mr Rajeev Tyagi of the Indian Forest Service. If you get a chance do watch the movie Two Brothers .Somehow I feel it is set in the same area and has a similar feel about it as Tiger Temple. You are hereby awarded the title of 'Tiger Rajeev'. You should have described in great detail how you felt holding that leash...:)You could first start with an introduction of yourself as to how passionate you are about Tigers reading all those Corbett books, stories and horror stories. 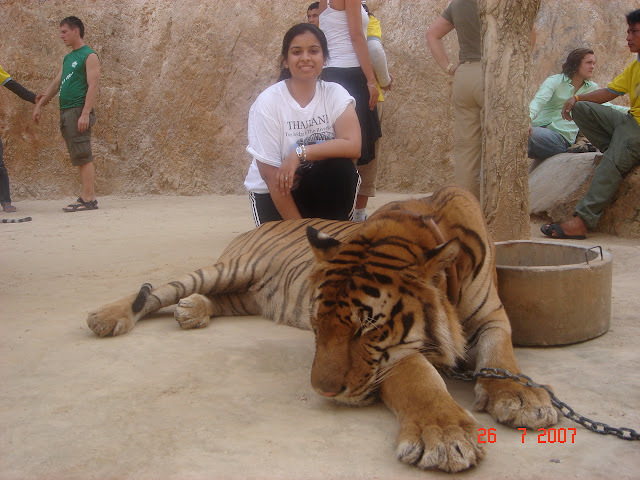 Then you should mention how excited you were about going to The Tiger Temple, the experience and then the crazy pandemonium when our memory/ battery got over just when we got to walk the tiger cub... lol!